The perfect addition to your cottage pine furniture collection, our Amish Pine Wood Double Trash Bin with Drawers provides an attractive solid pine cabinet for your kitchen or pantry while keeping trash tucked away neatly. 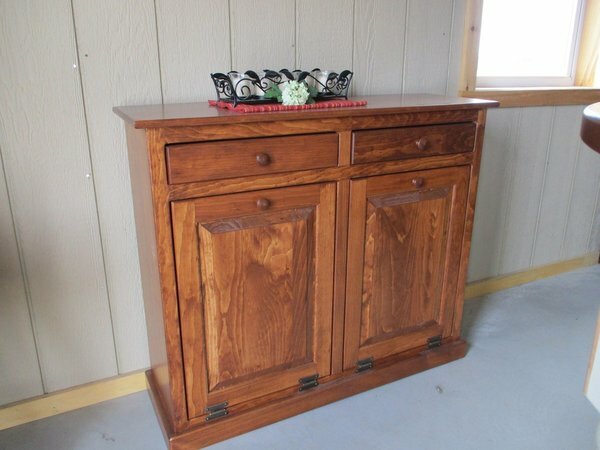 Complete with pine knobs, two pine wood drawers and two eight gallon trash cans, this Amish Pine Wood Double Trash Bin with Drawers supplies everything you need. Choose to have this pine cabinet handcrafted unfinished, with your choice of stain or paint, or with one of our hand painted designs on the front. This pine cabinet makes a lovely presentation as well as providing extra storage and surface space. Consider our Amish Pine Kitchen Jelly Cabinet to complement this pine bin. Our Amish Pine Double Trash Bin with Drawers ships fully assembled to your home. Call one of our Amish Furniture Specialists today at 1-866-272-6773 with any questions.